And so, my battles against the alien masterminds attempting to conquer the Earth came to a head the other night. If you've not kept up with my past posts, Simon has been somewhat reluctant to "lead from the front", shall we say. He's always been found behind some decent cover, or failing that at least another Xcom trooper. We were storming a crashed alien saucer, and despite the fact that two other troopers went in before him, it was Simon that the alien survivors noticed, unloading several heavy plasma shots into him. The uberstrong (and expensive) levitating armour didn't do its job and he was killed immediately. After this, I basically ignored any further alien ships, and just concentrated on building the Avenger craft to get us to Mars. 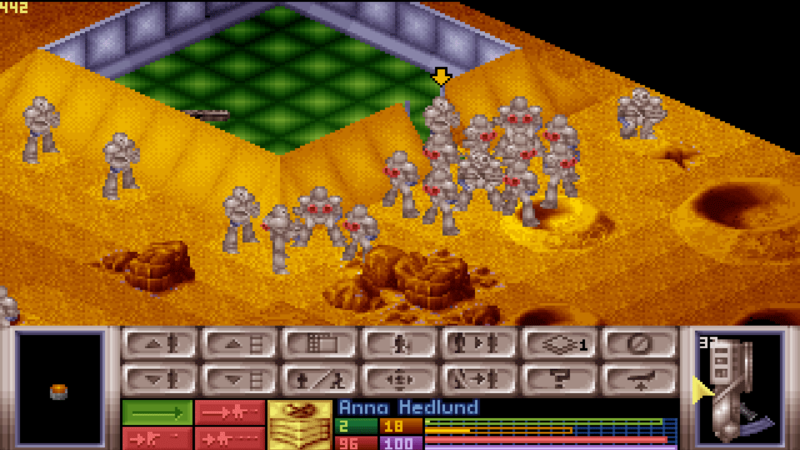 The nations of the Earth weren't overly happy with our new strategy of "Let the Earth burn just don't let them kill any more of our troops"
One exception, however, was when the aliens decided to attack my main base. 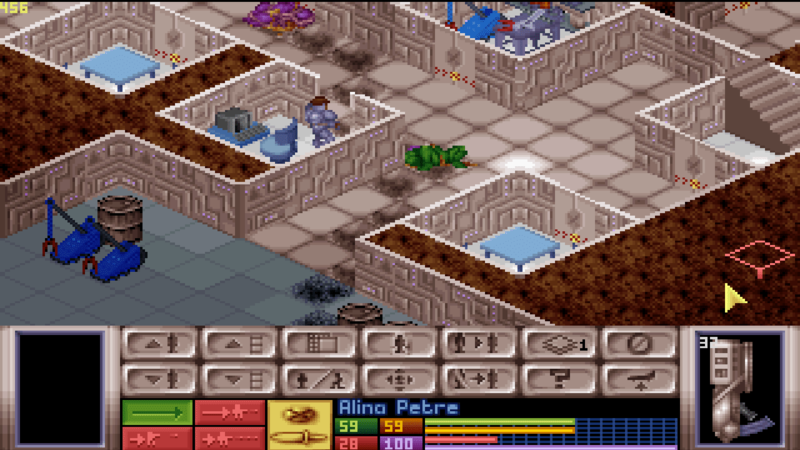 Due to the design of the base, Dustyweaver, my commander-in-chief, was left in the south-east quadrant of the base, alone with a pack of aliens, and with some very useful walls blocking him from the rest of the base - and the rest of my troops. 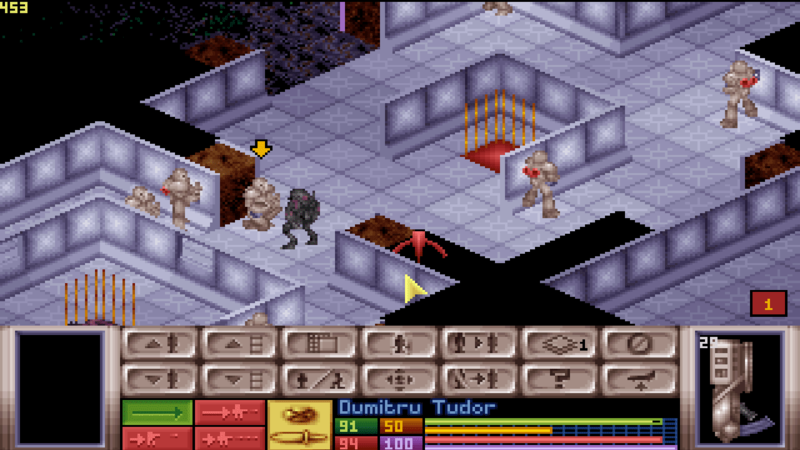 Dusty, with poor armour, and armed with only a laser rifle and a taser, didn't have great odds of survival. Particularly with his normal tactic of charging anything within reach. So, while the rest of my forces battled elsewhere, he became a master of guerilla warfare, popping out of rooms and blasting anything within sight, and then vanishing again. See the dead aliens? See the burn marks? That would be Dusty. As a result, by the time three of my men had managed to blast their way through a wall to rescue him, he'd already killed everything nearby. Time passed and finally we were ready to go to Mars! To begin with, we explored the strange sandy landscape, looking in alien pyramids, looking for a route to their underground base. 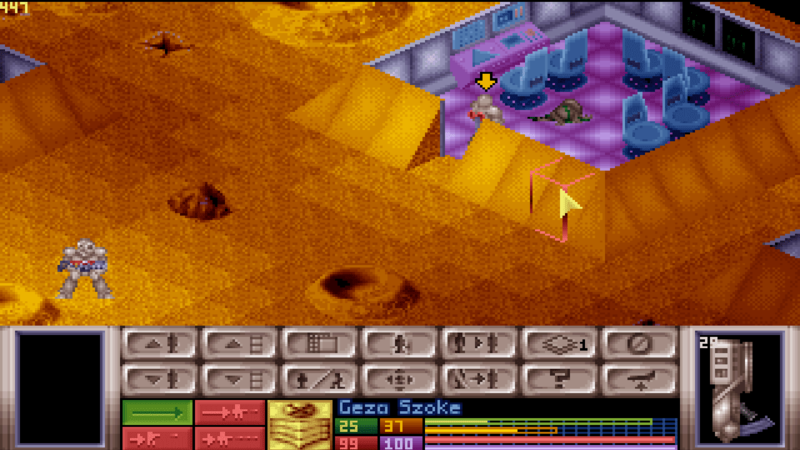 Geza walks in to an aliens home and shoots them dead in cold blood. We're no so different to them. Anna, reasonably displeased that everyone is wearing the same thing as her, refuses to let anyone in to the disco until they've changed. 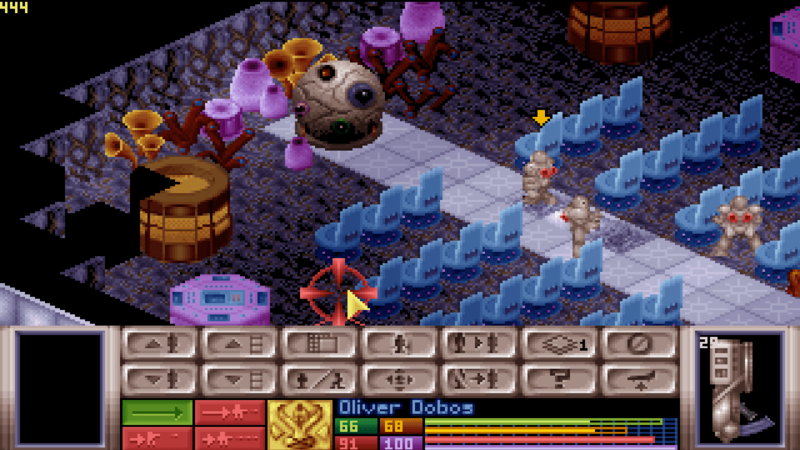 When we finally got into the base, the biggest threat seemed to be the aliens ability to mind control my troopers and force us to kill them. If we ever actually saw one of them they died pretty quickly, but my numbers were thinning out. Plus they had this ability to appear from nowhere and get up really close to you. You could put up with their razor claws, their psychic powers, their plasma weaponry - but the intrusion on personal space was really the last straw. Heading to the central core. 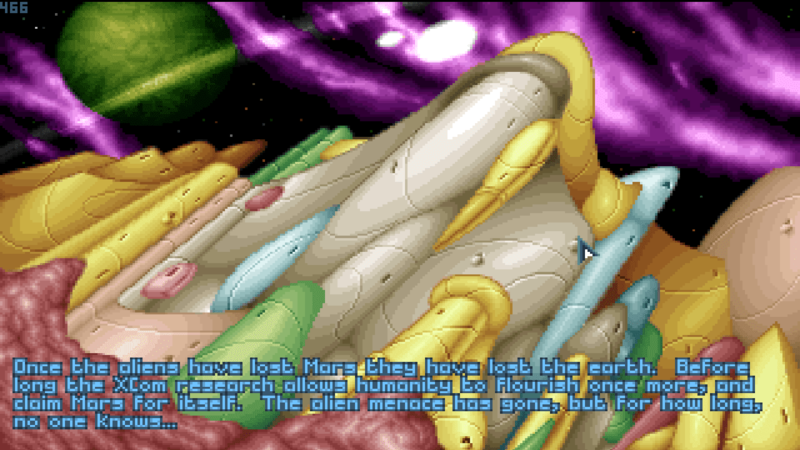 The alien mastermind - a brain - seemingly in some sort of theatre. Perhaps we intruded on some alien stand-up comedy. "Hey, don't you hate it when you kill a human - and he doesn't taste that good! That's just a waste of plasma! HAHAHAHA!!" When we finally found the alien brain in command, it didn't survive very long. 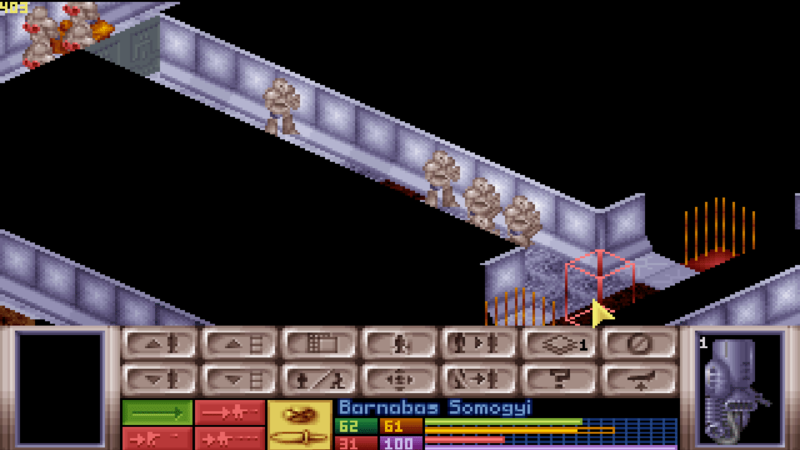 We were helped by a hole in the floor of their control room, so rather than using the lifts into the room, which were bound to be guarded, the men levitated through the hole and shot the aliens in the back, which is always my preferred tactic for any game which involves guns. Commander Dustyweaver did manage to punch some holes in the alien brain, but didn't quite finish it off - but there was plenty of troopers to finish the job. So, we finished OpenXcom! 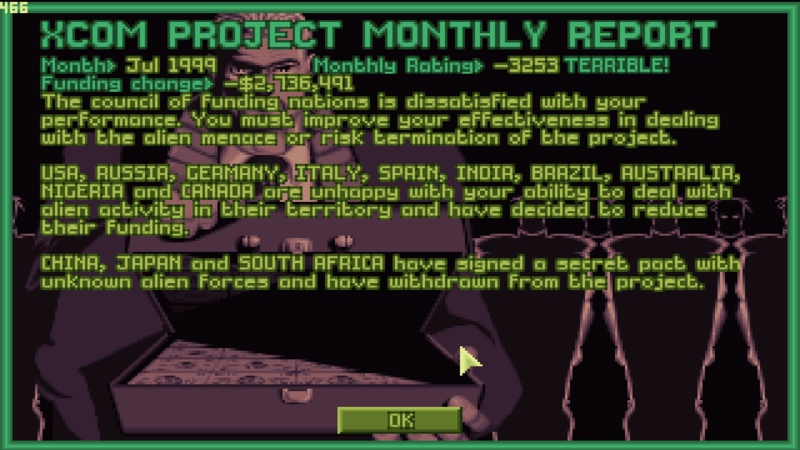 Yes, I hacked the soldiers to make them faster and harder to kill, and gave myself lots of extra money. But for me the story is what makes the game. 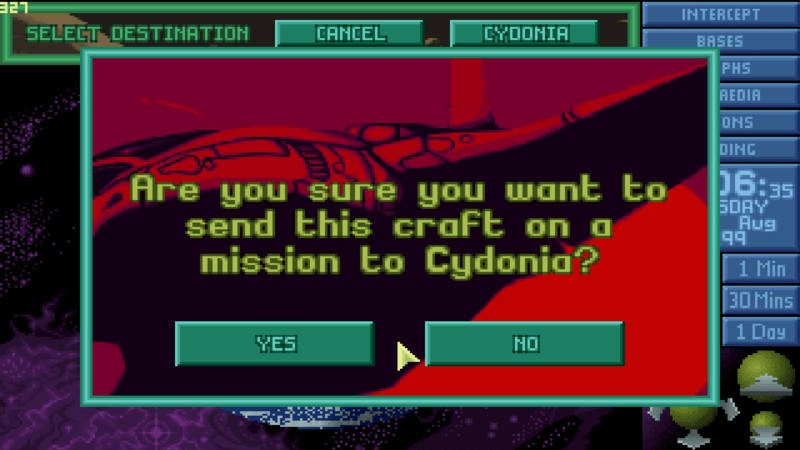 I find it interesting with games nowadays, I often find myself playing the level just to get to the next cutscene. Anyway - I'm going to see Tenacious D on Monday!